Bikaner, a place which is not so hyped but a must visit place. I was not sure what would be special to visit at Bikaner, but the Junagarh fort itself is one of its kind to visit and get awed. It is difficult to find exact palace like Junagarh fort. It is a privilege to see this place and its worthy to spend hours here. They are providing facility of guide with the ticket of 50 rupees for Indians. It is worth compared to other forts, where you have to spend continuously. The guide will take you to a detailed tour of the fort and you will be mesmerized to see, what a lavish lives Kings and queens were living. It is not possible for today’s rich people to acquire such huge pieces of land for themselves. Food at Bikaner: Don’t forget to have Ras Gulla of Bikaner and other food. People outside from Bikaner says that there is something in water here, which makes food so tasty. We missed the chance, but wish my readers don’t miss it. From Bikaner, we proceeded to Jaisalmer. To my surprise, whole roads from Bikaner to Jaisalmer were just empty. No person, just empty barren lands for kms on both sides. Warning: You have to be careful, while traveling, if you are using personal vehicle. Don’t mess with drivers. Wear proper clothes and don’t carry precious items with you. One more thing I noticed at Rajasthan, were foreigners, who were not at all wearing short dresses. They all preferred wearing Indian clothes such as Sarees, Punjabi Suits, Kurtis and no body show totally, which came to me as a big surprise. Perhaps, they are being warned at their particular embassies, as a precaution to be safe in India. Do we need to discuss anything about Jaisalmer? It is the capital of art and architecture in construction and Architecture field. Jaisalmer is also known as Golden city of India. Whichever place you will select to stay at, you can find a kind of Royal touch and treatment like a Royal. If you can select a hotel inside the fort. Here, people started living inside the fort since 18th century and the fort is covering Jain temples, Raja Rani Ka mahal, sun set point and many other places to visit. It was somewhat depressing to see Raja Rani ka Mahal as maintenance activities are not at all being practiced here and we can soon see ruins of the palace. It has become a home for thousands of bats and place was stinking with their smell. The scenario under the fort is just like some Egyptians carnival and you can go for a great shopping spree. It was not a surprise for me to see Jaisalmer in Rang Rasiya Movie when Raja Ravi Verma was in search of inspiration for his paintings and visited Patwao ki Haveli, Jaisalmer fort and other places from here. One more interesting place, where we enjoyed feeding cat fishes. It was a remarkable experience as I was astonished to see people sitting with huge number of breads. First thing came to my mind was do foreigners buy only bread to eat from here? Then I got solution to my query that car fishes eat bread and we got heavily delighted to see thousands of cat fishes surfacing at a time to catch some food. You can get very nice pictures here under the Chhatri and historical architectures. Our hotel was out of fort so we had great time sitting at Rajwadi set up on terrace and taking a distant look of lighted fort and having food. Our next day tour was the desert Safari, the most excited part of our Rajasthan tour. We had a tie up with our hotel for the sand dunes at Jaisalmer. Desert Safaris are organized by many different operators here. It is a planning like few hotel owner get together and organize their own evenings in the desert. Everyone has different kind of services to provide. Ours was planned near Sam village. The population here is totally Muslim and one more parallel track is there, Khuri village, majority population here is Hindu. We were taken to the area, which was near to the desert. As we were waiting some camel owners came up with there camels. We had 5 foreign residents with us. They had a deal to ride one person on one camel at the same rates. We were not aware about such deals so we had to accommodate on one camel. Though behavior of camel owners was very good. We found the touch of Pakistan there. The local residents dress up completely like Pakistan people do. They lack so much in facilities and delights of life, that we kept on thinking on the kind of life they live. How to get education or even the thought of buying a car would be so big for them. Just barren lands and nothing. We had a wonderful camel safari in the desert. We were taken to a place which was a small desert and were informed to spend some time here, till the sunset. Though sun was covered by clouds so we were not able to have the delight of watching sun set in the desert. 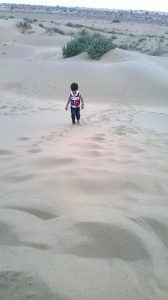 My son was happy to see warm sand that he thought he is suppose to play, just like the way he did at Sikkim with the snow. A state of serenity and calmness with deep peace of mind, which I experienced in my tour at Rajasthan and Sand Dunes. We then proceeded to our tents in our vehicles. Though they call the tents as Swiss tents, there was no such facilities. No soap, no fan, no towels, no mosquito repellent, we managed the night some how and above all winters have yet not started in the western parts of India. We were offered with tea and snacks on reaching then Lok Dayro or Rajasthani music started there. It was so exciting to hear padharo mhare desh, limbooda and Gujarati Rajasthani songs sitting in a circular pit created there. Typical Rajasthani dance completely lured me. Then started Rajasthani Kalbeli dance. It was awesome experience to view a girl dancing and picking up blades with her eyebrows. Though we were expecting a late night event with a camp fire, but nothing like that happened. As soon as dinner was announced, people rushed out of the program and after some Garba and dance, the program was wrapped up. Food they serve us was typical Rajasthani food such as Daal bati churma, rice and gatte ki sabzi. Morning we were offered real Rajasthani Nasta and we left for Jodhpur. I wished to proceed 3 more kms to study life at Sam village and border was just next to it. But time was not allowing.